Any updates that do surface will only address bugs, French site iGeneration noted on Thursday. The app's core functions should continue to operate, at least for the foreseeable future. 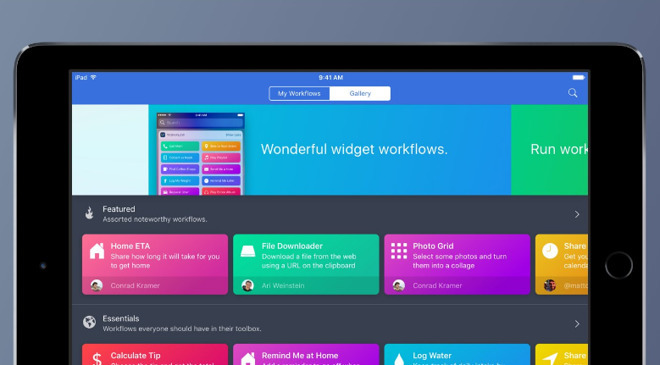 Apple bought Workflow in March, making it a free download on the App Store. Shortly thereafter the company began issuing refunds to recent buyers for the sake of good will. It's likely that Apple will eventually discontinue the app and fold Workflow's automation features into iOS, since it has adopted a similar pattern with past buyouts. After it bought Siri, for example, that app remained in the App Store for a while, but vanished completely once Siri made its way into iOS 5. Apple bought up HopStop in 2013, phasing out the app while using it as basis for bringing public transit directions back to Apple Maps in iOS 9. The company controversially removed transit directions in iOS 6 as a part of stripping out Google content. Workflow lets people link multiple iOS commands together into actions that can be triggered by a single button. Users might, for instance, get Maps directions home, or send a text message to a loved one saying they're heading to the gym.